Grapevine Ford invites Dallas-Ft. Worth-area truck shoppers to review the 2013 Ford F-150. A long-time favorite among Texans as a working truck, F-150 delivers best-in-class 11,300-pound towing capacity and 3,120-pound payload capability. Ford adds economy to performance with F-150's EcoBoost® engine, which uses twin-independent variable cam timing (Ti-VCT) to achieve an impressive 17/23 mpg rating. Family seating and Ford's advanced safety technology make this truck a winner on the job and off. Ford's Personal Safety System™ protects passengers with multiple sensors, restraints and airbags. With ten different models from which to choose, there's a Ford F-150 for everyone! The F-150 XLT offers a variety of engine choices, while models like the King Ranch have luxury features like heated and cooled power seats. While we're talking about seating, the F-150 SuperCrew® offers a 60/40 rear split bench with three-way configuration for when you need to carry extra cargo or seat extra passengers. Take some time to review the information below on the many features available for Ford F-150 in Dallas-Ft. Worth. 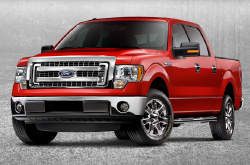 Check out the 2013 Ford F-150 side-by-side with versus similar autos like the 2013 Nissan Titan, Dodge Ram, Chevrolet Silverado and the Toyota Tundra, and you will find that the 2013 F-150 out does those vehicles in several areas. Check out the reasons see why! Take a peek inside the 2013 F-150 - view video now! Get real factory parts and phenomenal workmanship from Ford technicians at a plaza that's just a short cruise from your neighborhood. At our Ford auto repair center in Grapevine, we offer this and a year warranty on all jobs! Our Ford auto service facility in Grapevine is home to knowledgeable repair buffs, so take your F-150 over for trustworthy service. For regular oil changes and other Ford services like front and rear brake pad checkups and battery replacement, come to us. We even take on arduous operations with finesse, including jobs like shock and strut repair. It's very simple: If you want buffs service and inexpensive repair prices in Grapevine, make Grapevine Ford your first stop for Ford vehicle maintenance. You can check out coupons daily at the next link. 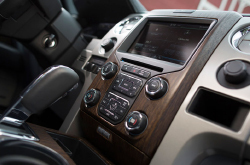 After reading up on the 2013 Ford F-150 features and specifications, you can see that there are many choices to be made. Each Ford F-150 model has a wide array of power, seating and accessory options. The F-150 XL and XLT are available in Regular, Super and SuperCrew cab styles. Option choices include advanced technology communication systems for making and receiving calls while driving, along with convenient features such as remote keyless entry, power sliding rear windows, power pedals with memory and SiriusXM satellite radio. Grapevine Ford's helpful staff is ready to help you match-up the model and package best suited to your needs. Whether you opt for the EcoBoost® V6 or the powerful 6.2-liter V8 engine, you'll know you're getting best-in-class towing and payload abilities with a gas-saving, electronically controlled, 6-speed transmission. Come see us at Grapevine Ford to find out why Ford F-150 is favored by Dallas-Ft. Worth-area truck shoppers who appreciate a tough-performing, economical truck.